Who most often has gout? What happens in the joint? What diseases can be taken for gout? Gout is a systemic, that is, a disease that affects the entire body, in which crystals of uric acid, sodium monourate sodium, are deposited in various tissues. At the same time (in the presence of provoking factors), patients with a high content of uric acid in the blood serum develop inflammation of the joints. It is believed that the classic portrait of a gout patient is a large middle-aged man, wealthy enough to regularly eat good red wine and young meat. I remember the English kings and dukes, our compatriots - emperors Peter I and Anna Ivanovna. But studies convincingly prove that the incidence of gout is determined not only by the diet and well-being of patients. It is estimated that at least 3% of the adult population of the planet suffer from this disease. What is true, it is true: men suffer from gout many times more often: there are 7 men with this disease per woman receiving treatment for gout. The disease begins in men much earlier: at the 40-year mark, while the peak in the incidence of gout in women is at least 60 years old. It is believed that this is due to the natural level of hormones that promote the removal of uric acid from the body, and protect the female body from many different troubles. In connection with concomitant diseases, drugs are prescribed that have a side effect of increasing the concentration of uric acid. Determining whether a drug raises uric acid levels is quite simple: just look at the instructions for use of the drug. Most often, hyperuricemia is caused by anticancer drugs, diuretics (diuretics), and beta-blockers (a group of drugs used to treat arterial hypertension). If a patient receives treatment from an oncologist, then medications aimed at reducing uric acid are usually assigned “automatically”, and the development of gout in this group of patients can be avoided. With other drugs, the situation is much more complicated. One of the most "popular" among domestic therapists diuretics is furosemide. This drug is quite fast and powerful effect, producing a diuretic effect, and therefore its appointment for a long period is not recommended. However, it is not uncommon for patients to take furosemide for several months or even years, as prescribed by a therapist or, more often, on their own will. Against the background of such a “treatment”, gout develops with characteristic signs and possible rather serious complications. If the concentration of this substance in the blood exceeds the permissible limits (more than 320 μmol / l), a complex chemical reaction is triggered, and crystals begin to form from the acid, in the people they are also called “sand”. It is these crystals that are deposited in the joints, skin elements and other organs, and cause gout - the “disease of kings”. Joint pain arises not so much from “mechanical injury” by crystals of surrounding tissues, but rather from penetration into the joint and the production of a huge amount of “inflammatory substances” directly in it. That is, the cause of pain in an arthritic attack is not mechanical (sharp crystals), but chemical (irritating substances). Attracted by "inflammatory substances" (they are called inflammatory mediators), immune cells penetrate the joint, which, on the one hand, produce even more mediators, on the other, begin to destroy their own joint structures, taking them for "attack of foreign agents." This is a brief description of the development of an autoimmune reaction in gouty arthritis. Currently, it is customary to distinguish between acute gouty arthritis, interictal period and chronic gout. This is the main clinical, that is visible to the eye, manifestation of gout. Acute gouty arthritis, or a gouty attack, is considered to be one of the most painful conditions in rheumatology. The symptoms of an arthritic attack are so vivid that they once inspired artists to create masterpieces that survived the centuries. Pain during a gouty attack occurs at night or in the early morning hours, and is so severe that the patient is not able to not only move his foot, but even a light touch of the sheet causes unbearable torment. Without treatment, acute gouty arthritis lasts no more than 10 days, but in almost 100% of cases, patients still seek medical help. Most often, patients go to an appointment with surgeons complaining of pain like drilling, tearing, burning in the first (big) toe, and classic “folk” painkillers like analgin do not help the patient. Attempting to take a warm foot bath only increases the suffering. In search of an effective anesthetic, both patients and surgeons are often able to make a lot of mistakes, starting with prescribing unimaginable combinations of analgesics in large doses, ending with the use of antibiotics and local (dermal) agents (gels, ointments) - ineffective but expensive. True gout in daily practice is not so common, but many doctors have an idea that this ailment is treated with allopurinol (we'll talk about it a little later). But that categorically it is impossible to prescribe allopurinol in the acute period of the disease, is usually forgotten. Moreover, allopurinol can aggravate the course of a gouty attack, and if the patient has already taken this medication by the time of exacerbation, it should be canceled as soon as possible for the entire "painful" period. Another common mistake in the treatment of an acute gouty attack is the patient's refusal to eat. As it is known, most often “gout attack” is provoked precisely by an error in the diet. In search of relief, the patient is ready to switch to “bread and water”, or even starve, just to get rid of the pain. This is fundamentally wrong, and can adversely affect both the general condition of the patient and the work of the kidneys and heart. Wanting to relieve the patient from suffering as soon as possible, doctors often prescribe physiotherapy (UHF, magnetic therapy, thermal procedures), not taking into account the almost complete uselessness, and sometimes the harm of such tactics during an attack. Gout leads the attack on the body gradually. It is a mistake to believe that this problem is limited to the joints. Urate crystals - the smallest needles - are deposited in many organs, primarily in the kidneys, forming stones, disrupting the work of these vital organs. The patient may be disturbed by renal colic, manifested by pain in the lower back, side of the stomach, vomiting, pain and cramps during urination. Sometimes the severity of pain is such that it requires hospitalization, or surgery to remove the stones. With inadequate treatment and accumulation of uric acid and its salts, the disease goes so far that the heart is affected, with the development of heart failure. Tofusi are soft formations, bumps, "bumps" filled with urate crystals. Most often tophi are located on the back (outer) surface of the fingers, auricle, elbows, knees. But tophi can be hidden, that is, located inside the body: in the area of ​​the joints, for example. Such "depot" crystals can not be seen without additional methods of examination - radiography and ultrasound. The diagnosis of gout is based on three pillars: examination of the patient and talk with him, laboratory and instrumental methods of research. The classic picture of gouty attack is painful on palpation, red sometimes to blue, hot, swollen big (first) toe. The patient may notice an increase in body temperature, chills. In almost half of the cases, the first gout attack is the last, but in the remaining 50% of cases the course of the disease becomes chronic. With such a long-term process and repeated attacks, problems with other joints appear: the big toe of the second leg, ankle, knee, wrist joints. Polyarthritis (inflammation of many joints) develops. Interestingly, in recent times there has been an increasing departure from this classic picture, so juicy in the literature. Increasingly, gout is found with an initially large number of affected joints. In addition, over the past 20 years, many patients with gout from the first days take a protracted nature, the exacerbations of the disease recur again and again, and the pain is still intense, regardless of the number of suffered attacks. A general clinical blood test (mainly an increase in the erythrocyte sedimentation rate (ESR) is a sign of inflammation and an increase in the level of white blood cells) and biochemical (an increase in uric acid is detected, and signs of concomitant diseases such as diabetes, liver disease, renal failure, and others) can be detected . It should be remembered that the concentration of uric acid in the serum, which is determined by biochemical analysis, at the time of the attack can be normal! Study of the articular (synovial) fluid . This procedure can be quite unpleasant, but it is precisely as a result of the articular puncture (puncture) that the doctor will be able to get with sufficient accuracy the answer to the question: “What actually happened?” Joint joint puncture greatly facilitates the patient’s condition, because, first, from the joint excess fluid is removed, causing a feeling of pressure from inside and containing a large amount of "inflammatory substances". Secondly, in the joint cavity, in the absence of contraindications, a drug is introduced, which quickly removes signs of inflammation. The resulting liquid is collected in a test tube and sent to the laboratory for analysis and microscopy. If sodium monourate crystals of characteristic size and shape are found, the diagnosis can be considered “in the pocket”. Analysis of tophus content . If there are soft formations (like bubbles or warts) available for examining and taking the material, the rheumatologist usually tries to get their contents for analysis. When viewed with the naked eye, what stands out from tophus, vaguely resembles cottage cheese, and microscopy reveals the same crystals as in the synovial fluid. X-ray . A radiologist can answer the following questions: are we dealing with gout? If so, how far has the disease gone? Is there another pathology of the joints, against the background of which gout was played? Ultrasound examination of the joints . In the case of gout, this is a much less informative method than radiography. Currently, new methods are being developed that could help determine the presence of uric acid crystal deposits in the joints. In the meantime, an ultrasound doctor can only determine whether arthritis really takes place, how much fluid is in the joint, and whether we can take it to analyze whether there are traumatic injuries of the soft tissues of the joint that could be “disguised” as a gouty attack. What other diseases occur according to a scenario similar to gout? Especially this information will be useful to those who are accustomed to make a diagnosis, using reference books or information from the Internet. 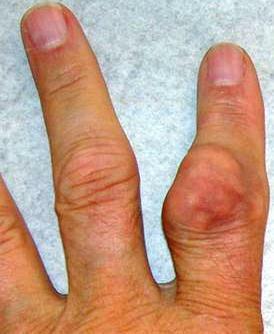 septic (purulent) arthritis . This condition may be preceded by any skin or "general" infection, trauma or microtrauma of the soft tissues around the joint. Almost always, septic arthritis is accompanied by an increase in body temperature. The diagnosis is clarified with the help of the same articular puncture, and already in appearance of the fluid obtained, the doctor will make a preliminary conclusion about the diagnosis. reactive arthritis . This disease is a response to the presence of any pathogen in the body, and is treated accordingly, together with a rheumatologist and an infectious disease specialist. psoriatic arthritis (inflammation of the joints in combination with a skin disease - psoriasis). It is accepted to separate non-drug (non-drug) and drug treatment. Non-drug treatment includes diet therapy, the use of orthopedic means and unloading of the joint, as well as lifestyle correction. Not every patient who is accustomed to limit himself neither in nutrition, nor in passive leisure, nor in movement by personal transport, is ready to change his habits for the sake of his own health. And, nevertheless, it is extremely important to set up the patient for the implementation of recommendations, which, in fact, is half the success. The treatment of gout has two main directions: reducing pain during the period of gouting attacks and reducing the risk or completely preventing new attacks by reducing the deposition of salts - urates. To achieve this goal, anti-inflammatory and anti-hyperuricemic (that is, directed against increasing uric acid concentrations in the blood) remedies are used. The undoubted advantages of this group of drugs is that they begin to act quickly, and exactly where it is needed - in the inflamed joint. It is very important to remember that increasing the dose will not necessarily lead to greater effect. The anti-inflammatory effect will remain the same, but the harm from such a “tactic” will be much more, because with an increase in dose, the likelihood of development and the severity of side effects increase. According to international studies, etoricoxib, also known as arcoxia, is considered to be the most effective and safe in this group. Another advantage of nonsteroidal anti-inflammatory drugs is the ability to penetrate the central nervous system. What is it for? The fact is that if a person experiences pain in remote areas of the body, then a signal about this immediately enters the brain and may increase the subjective sensation of pain, and, therefore, multiply the suffering of the patient. Next, a cascade of pain responses occurs: increased heart rate, vasoconstriction, release of stress hormones, high blood pressure ... The use of nonsteroidal medications helps reduce or prevent these effects. This medicine is rarely used at present, although its effectiveness in gout is undeniable. In most patients, it causes upset stools and nausea, a metallic taste in the mouth. However, it is resorted to for its intended purpose, if for any reason the use of nonsteroidal anti-inflammatory drugs becomes impossible. It is important that severe damage to the kidneys, heart, liver and mucous membrane of the gastrointestinal tract - strict contraindications to the appointment of colchicine. The prescription of this group of drugs is a rather difficult and responsible decision. Steroid hormone drugs, or steroids (prednisone, metipred) are prescribed in cases when nonsteroidal anti-inflammatory drugs do not help, and colchicine is either ineffective or unavailable. When treating with steroids, it is necessary to monitor the patient’s condition so thoroughly that the doctor will often think ten times what these effective, but not very indifferent, means for the body will prescribe. Among the side effects (they are also called undesirable) effects of such therapy are elevated blood pressure, increased blood glucose, a tendency to bleeding, the risk of damage to small eye vessels, gastrointestinal ulcers ... and this is not a complete list. Recall that gout often affects obese patients who are initially at risk for many of the above conditions, multiply this by the side effects of steroids and get a rather sad, in terms of prognosis, picture. in the treatment of anticancer drugs. Products that contribute to the onset of gout have already been mentioned. What can you eat and drink to a patient with a gouty attack or a high content of uric acid in the interictal period? From the first courses you can recommend vegetarian soups, such as soup or vegetable or potato. Meat, as already mentioned, is strictly limited - it is chicken or duck. “Lenten” fish varieties are allowed (cod, pollock), no more than 3 times a week, in moderation (maximum 200 g per reception). Whole milk is not recommended, you should give preference to lactic acid products (kefir, cottage cheese, ryazhenka, young cheeses). Feel free to choose any cereals or pasta as a side dish, bread is not limited (within reason, remember the dangers of excess weight!). Vegetables and fruits, except raspberries, spinach and cauliflower, are all allowed, better boiled or raw, fried - not welcome. It is allowed to eat any nuts and dried fruits, from sweets you can treat yourself to honey, molasses, marshmallow, nuts. It is useful to add enough olive oil to food. Of the drinks allowed weak green tea, juices, fruit drinks, fruit drinks. Ideally, such a diet should be followed not only during a gout attack, but throughout the illness, as long as there is an increase in blood uric acid levels. After eliminating pain, the doctor must make sure that the level of uric acid remains safe for the patient, and the dosage of allopurinol is selected correctly. For this purpose, regular determination of the level of uric acid is carried out using a biochemical blood test. At the beginning of treatment, this should be done every 2-4 weeks, then every 6 months. If the optimal dose of medication is selected, the patient is on a diet, returned to physical exercise, does not encounter arthritic attacks, does not need to take painkillers and anti-inflammatory drugs, the dose of allopurinol can be slowly reduced under the supervision of a physician. Practice shows that it is quite rarely possible to completely cancel it. Unfortunately, in the overwhelming majority of cases, patients who have canceled allopurinol are forced to return to it after a repeated gouty attack. Almost all patients with gout survive to their advanced years, suffering more from comorbidities than from joint pain. But it is also known that nephrolithiasis (kidney stones) and renal failure develop in almost half. As already mentioned, gout belongs to the group of diseases caused by impaired metabolism of calcium salts in the body. The same group includes a disease associated with calcium pyrophosphate salt deposits, or pyrophosphate arthropathy. These two diseases are so similar that they are considered as one large section - crystalline arthropathy. This disease occurs equally often in women and men of older age, and among patients over 85, according to research, half have this pathology. The disease occurs under the guise of osteoarthritis, gout or rheumatoid arthritis. Usually, the development of pyrophosphate arthropathy is accompanied or preceded by some chronic disease (for example, diabetes mellitus, thyroid disease) or the patient has ever suffered a joint injury. When an elderly patient complains of pain, it is more common in large joints (most often the knee) that the doctor will prescribe an X-ray. If the “double line” of the joint space, the so-called chondrocalcinosis phenomenon, is detected on the X-ray. In addition, evidence of the diagnosis of pyrophosphate arthropathy is the detection of specific crystals in the study of articular fluid under a microscope. If the joint is inflamed, then this fluid, as in the case of gout, is obtained by puncture (puncture) of the joint with a syringe. Further, it is only for the laboratory. If the joint fluid cannot be obtained for analysis, this may make the diagnosis much more difficult. Pyrophosphate arthropathy, discovered by chance (for example, with X-ray), is not treated if there are no symptoms of inflammation of the joints. If there is arthritis (that is, swelling, redness, changes in skin temperature above the joint), and all other causes of these symptoms are eliminated, the excess fluid from the joint is removed with a syringe, then steroids are injected into the joint and cold applications are applied. Further, a course of treatment with nonsteroidal anti-inflammatory drugs is prescribed. Short courses of steroid hormones or colchicine are extremely rarely prescribed. And of course, the main role is played by the treatment of associated diseases that caused the deposition of crystals in the joints. Also non-medicinal methods, such as physiotherapy, physiotherapy, often with the use of cold (in the absence of contraindications), wearing an orthosis and others, are also important.